The toddler years are a whirlwind of exploring, discovering and learning, and your child will be developing a huge range of new skills to prepare them for life as a pre-schooler. 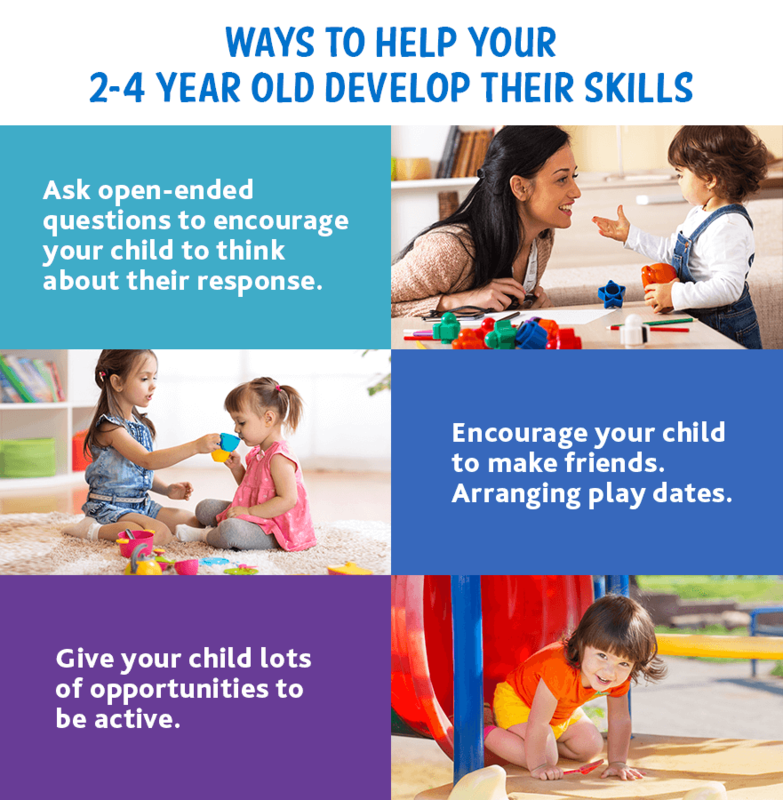 The key skills that your child will be developing between the ages of one and four years old fall into six categories – verbal, creative, cognitive, interactive, physical and fine motor skills. All of these are important for ensuring that they’re well prepared for the next stages of childhood, so if you have any concerns about your child’s development in any area, you should talk to their doctor. You can also use our toddler growth tool to check that your child’s weight is within the expected range. 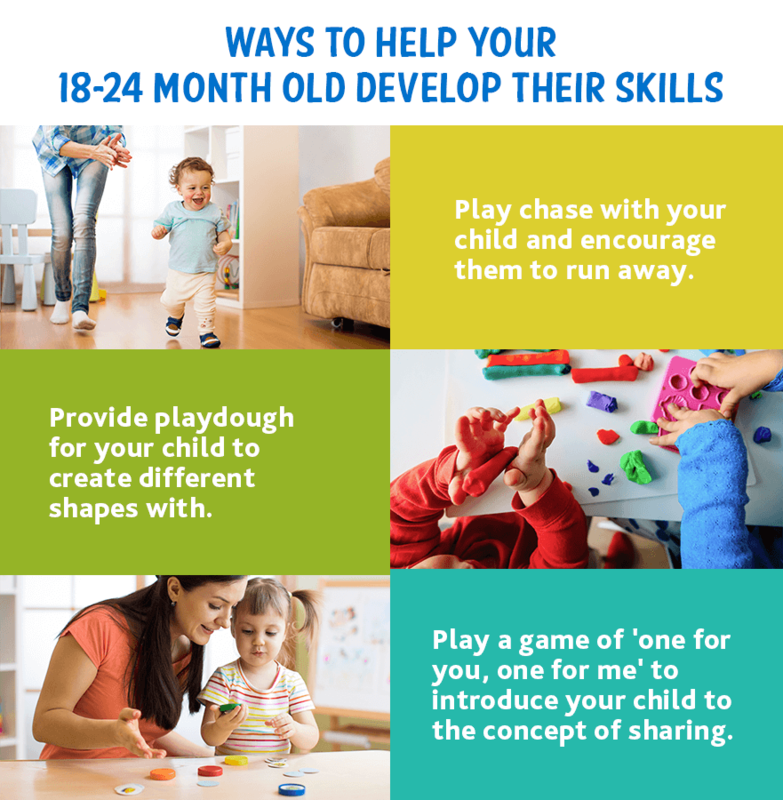 To make it easier to see the skills that your toddler should be learning, developing and eventually mastering, we’ve put together a set of child development checklists covering their development between the ages of 12-18 months, 18-24 months and 2-4 years old. Welcome to one of the busiest child development stages! Your one year old is growing fast and you may be wondering where that little baby went! It’s amazing how quickly toddlers start to pick up and develop new skills during this child development stage. 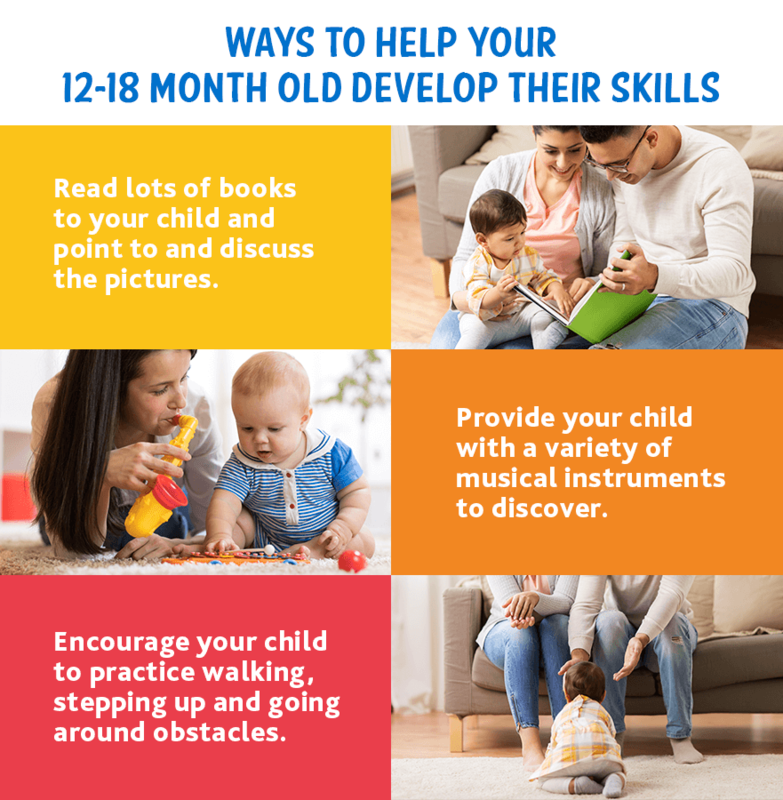 Between 12 and 18 months, it’s likely that your little one will start to speak and learn to walk – two huge development milestones that you’re likely to remember forever! Read lots of books to your child and point to and discuss the pictures. Encourage your child to copy your actions – clapping or waving ‘bye bye’ for example. Get into the habit of pointing out things you can see in the world around you. 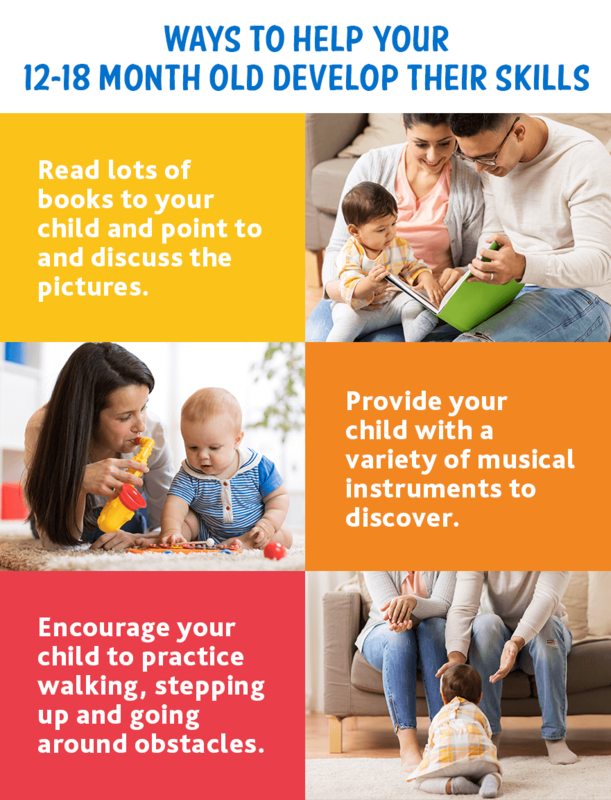 Provide your child with a variety of musical instruments to discover. Play interactive games like ‘peek a boo’. Help your child to stack a set of stacking cups (and knock them down!). Put objects on the ground for your child to pick up. Encourage your child to practice walking, stepping up and going around obstacles. Point to different parts of the body and name them. Hide a toy under a cloth for your child to discover. As your child continues to tick off their child development milestones, it’s likely that you now have a walking, talking toddler on your hands! As they approach their second birthday, they’ll now be developing those skills further – building a bigger vocabulary and learning new physical skills like running, rolling and jumping. Your child will also be starting to understand that other people have feelings that are independent to their own – one of the biggest interactive child milestones. Play chase with your child and encourage them to run away. Sit on the floor and roll a ball back and forth between you and your child. Provide play dough for your child to create different shapes with – a ball and a snake, for example. Play a game of ‘one for you, one for me’ to introduce your child to the concept of sharing. Play ‘what’s in the box’, where your child tries to remember what items you just hid from view. Ask your child to try to match different sized lids to the right pots. Ask your child how you should use an object such as a hairbrush or ball. This is the age that you’ll watch your child tick off all those important toddler milestones and turn into a curious pre-schooler who is able to have conversations and play with others. You may even see those very first friendships forming. 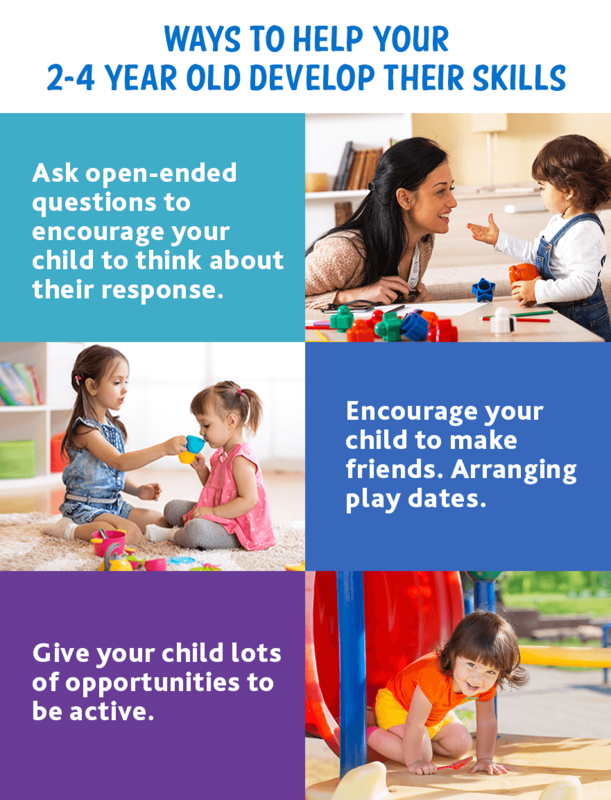 Ask open-ended questions that don’t have a yes or no answer, to encourage your child to think about their response. Talk to your child about what happened during their day. Provide your child with a variety of musical toys and art materials such as crayons, paper and play dough. Use character voices and gestures to make reading to your child a more engaging, dramatic experience. Help your child to complete simple puzzles and play memory games using flashcards. Play a sorting game where you help your child to categorize objects by their different characteristics. Encourage your child to make friends. 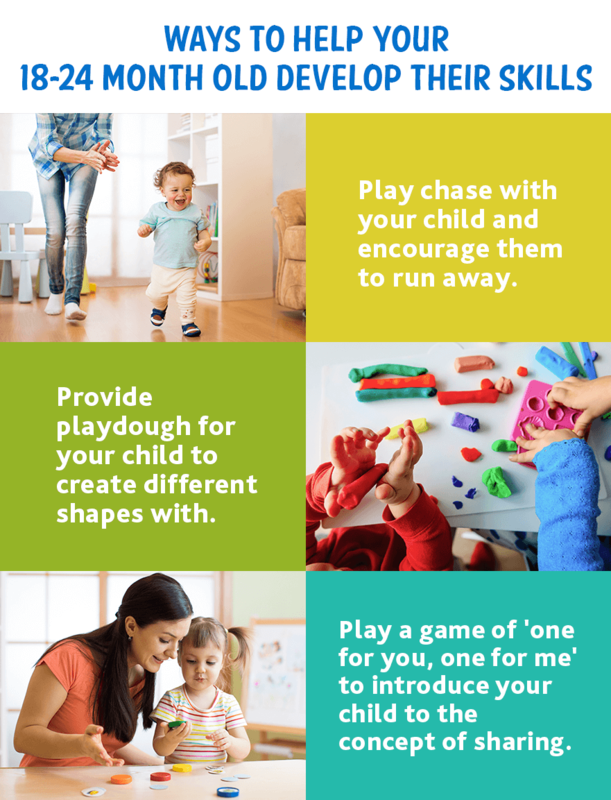 Arranging play dates can help them get used to concepts such as sharing and playing games together. Give your child lots of opportunities to be active. Active games such as throwing a ball through a hoop are great fun and will help to develop physical skills and hand-eye coordination. Remember, while child development charts and checklists can give you an idea of the things the average child will be able to do, all children are different. Some toddlers develop quicker in some areas and slower in others, and there may be certain skills that your toddler struggles to pick up. This is not normally cause for concern, but if your child is considerably far behind the expected skill level you should speak to their doctor.